Announcement Crochet Critters are handmade by me with quality yarns and stuffed with craft fibrefill. All critters designed for babies have stitched on features. Crochet Critters are handmade by me with quality yarns and stuffed with craft fibrefill. Crochet, Amigurumi, Blair the Ancient Herbivore, crocheted critter, handmade, baby, child, toy, softie, gift. Crochet. Amigurumi. Twins, Bancroft and Bentley the Ancient Herbivores, handmade, baby, toy, softie, gift. Crochet. Amigurumi. Bogart the Mini Monster; stress ball, handmade, crocheted critter, executive toy, softie, gift. Crochet. Amigurumi. Alfie the Mini Monster; stress ball, handmade, crocheted critter, executive toy, softie, gift. Crochet, Amigurumi, Beatrice the Ancient Herbivore, handmade, crocheted animal, baby, child, toy, softie, gift. Crochet. Amigurumi. Arnold the Monster; handmade, crocheted animal, teenager, toy, softie, gift. Crochet. Amigurumi. Vincent the Monster; handmade, crocheted animal, teenager, toy, softie, gift. Crochet, Amigurumi, Bradly the Ancient Herbivore, handmade, crocheted animal, baby, child, toy, softie, gift. Crochet. Amigurumi. Barney the Brontosaurus; crocheted critter, handmade, baby, child, toy, softie, gift. Crochet. Amigurumi. 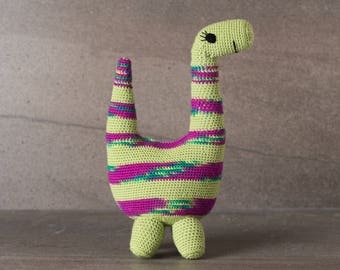 Bridget the Brontosaurus; crocheted critter, handmade, baby, child, toy, softie, gift. The most delightful toy l have seen. So, so cute and the little recipient of Barbara the Brontosaurus squealed with glee and shook with absolute delight. Thank you. Barbara the Brontosaurus; amigurumi, crocheted, crocheted critter, baby, toy, softie, gift. I bought this as a gift. It is so pretty and looked lovely on. Postage was super-quick! Thank you. Hand crochet bright daisy necklace with knitted I-cord. Main difference between Blair and Bentley is size. The pattern, quantity of yarn and time are equal. Both cost the same. It can take many tiny pieces to make an amigurumi critter. Merlin and Archie, members of the Harrison clan. Both are rescue cats who joined the family in 2014. I have always been creative, making things with my hands. As a graphic designer (before computers), I got to design and produce many different things and after the birth of my two boys, I gave up full time work and started looking for other creative outlets. My mother taught me to knit and crochet when I was at primary school. Many years of following patterns and making a variety of items I started to design simple knitted projects like scarves, jewellery and blankets. I discovered the book "Hello My Name is Amineko" by Nekoyama and the world of Amigurumi (the Japanese art of crocheting small stuffed yarn creatures) opened up to me. I made many cats from patterns I purchased and donated them to cat rescue organisations for fundraising. I have started to design my own Crocheted Critters for young children, working with quality yarns like merino wool, kid mohair and cotton. Bright colours, simple shapes and expressive faces make them idea for young children. My amigurumi cats are not for sale in this shop, they are made for fundraising only. In December 2017, I decided to redesign my Etsy jewellery store and sell my Crocheted Critters. My shop's name “The Loopy Cat”, represents working with loops (knitting and crocheting) and I love cats! Having a son who is a photographer (www.geoffharrisonphotography.com) solved the problem of trying to take quality photographs. I keep coming up with new ideas and experimenting with different textures; sometimes they go into my shop and sometimes they sit in a box. I hope you will revisit my shop in the future to see how things may have evolved. I am a retired graphic designer who works with beautiful yarns and creates critters for children and adults who will cherish them for years. I also love cats. I’m a retired graphic designer who loves to work with beautiful yarns. I make all items in my shop in a cat friendly, smoke free studio. I design my Crocheted Critters and credit designers when a pattern is used. If there is a problem with your purchase please contact me and I will do my best to rectify the situation. Please read the description of the item carefully. Colours are exact as possible but may differ from monitor to monitor. Each item is handmade using quality materials and is shipped in perfect condition. Returns are accepted on all items (except custom work) within 7 days of receipt. Please contact me if you would like to return an item. Once the item has been received in original condition, a refund will be issued, minus shipping charges. ALL shipping fees are the responsibility of the customer and will not be refunded. Australian buyers may choose PAY BY OTHER as an option to direct deposit into my account. Please contact me for details. Payment must be made in full and have cleared before the item is shipped. If you are having any issues with PayPal or are worried about delays, please do not hesitate to contact me. Please be sure your Etsy and PayPal/credit card address match. NOTE: Happy to ship to other places, please contact me for a quote. Australia Post divides the world up into 7 different zones and each is priced differently. Domestic orders are shipped by regular post, but if you need your order in a hurry, I can ship Express - just ask me for a quote before finalising your order. In accordance with Australia Post requirements, all parcels are shipped with a customs slip. Customs charges and taxes are the responsibility of the recipient. I am not aware of or responsible for any extra customs, fees, or duties imposed on your package when it arrives in your country. The minimum weight for parcels is 500grams so if you purchase a second items at the same time there possibly will be no added postage cost. Contact me before placing order and I will weight the items together. Australian buyers should receive their item between 5 to 10 days after sale. International buyers should receive their item between 10 to 14 days, all going well with postal services. I am not responsible for delays caused by issues within the postal service. *Shipping does not include tracking or insurance. Australia Post does provide a tracking service, but it is quite expensive. If you require insurance or shipping with a tracking number please contact me before finalising your order to get a quote. Insurance and tracking costs need to be added to your total. Custom orders are more than welcome!! Just contact me (before placing order) with your request and I will let you know about pricing and time. No returns on custom made items.